Essendon is one step closer to securing a finals berth following an upset 18-point win over Williamstown at Windy Hill on Sunday. The Bombers trailed at quarter time but kicked away during the second and third quarters, eventually winning 18.11 (119) to the reigning premiers 15.11 (101). Shaun McKernan was outstanding for the Bombers, spending the majority of his time forward and finishing with 21 disposals, 11 marks including six contested and four majors. 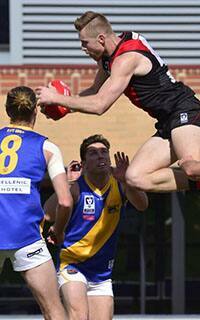 The Bombers injected some enthusiasm into the line-up with first gamers Alex Boyse and Nick Hind impressing at either end of the ground, while Charles Lill played his first VFL game after a battle with cancer and one game in 2015. Jason Ashby kicked the game’s opening goal, but the Bombers lead was short lived with the Seagulls hitting back with the next three. Boyse then kicked his first VFL goal followed by McKernan’s first of the afternoon. The visitors regained the lead with two goals from close range, but Gach Nyuon and Will Hams cut the margin to two points at the first change. The Dons then clicked into a new gear in the second quarter, one that we haven’t seen over the last month of footy. Boyse kicked his second goal and Aaron Heppell joined the goal kickers list to give his side the upper hand before the Seagulls hit back to reclaim the lead. Mark Jamar was having a big influence on the game and was dangerous when resting forward. The returning ruckman missed a couple of opportunities in front of goal but set up Sam Heavyside for an easy goal from the square soon after. The Bombers were pressing but were wasteful in front of the sticks until Shaun Edwards converted from 50 metres with a torpedo more commonly seen back in the glory days of Windy Hill. Goals from Alex McLeod and Boyse’s third for the half stretched the lead to 27 points before Williamstown’s Ayce Cordy marked and goaled after the half time siren. The Bombers playing group was vocal at half time about maintaining the pressure and intent and the start of the third quarter looked promising with a set shot goal to McKernan. McKernan’s third soon after, a dribble goal from the pocket, highlighted the impact he was having both in the air and on the ground. Lill was looking more settled as the game went on and Hind was showcasing his talent from the backline, repeatedly launching the Bombers back into attack. McKernan’s fourth of the day and a quick snap from Nick Kommer stretched the lead to 38 points, with the Bombers on top all over the ground and relishing the contest. Great courage by Boyse and Ben Dobson helped set up Heavyside for the Bombers fifth of the term before the Seagulls again goaled after the siren, this time through Cameron Lockwood. The final quarter started much like the fourth, with a shot from McKernan who this time couldn’t convert. Edwards took a contender for mark of the day and the Bombers looked to have done enough when Ryan Crowley kicked truly from outside 50. The Seagulls booted the next three goals but Will Hams was able to sneak forward and ease the nerves in the crowd with a goal to seal the win. Crowley led the way with 24 disposals and a goal, Ashby had 22 while Aaron Heppell and Ben Dobson both had 20 touches. Edwards finished with 19 possessions, Hams had 18 touches and two goals and Heavyside kicked two goals to go with his 17 touches. Coach Matthew Egan said it was great to see the game plan come together and produce a win. “It was much more enjoyable this week, we had some bad losses but we narrowed our focus, we were rapt to see the boys implement the things that we have planned during the week,” Egan said. Egan said the impact of Lill’s return and the debutants Boyse and Hind were key factors. “It was a lot of little things for the game, it was Charles Lill’s first game back we were really excited about his journey and all his been through to get back," he said. “Boyse and Hind playing their first games you get some real excitement and enthusiasm right from the start by playing those three players. Jamar back in the side allowed McKernan to play solely as a forward while the rest of the team was thrown around to try and find some form. “We mixed up the team a lot, we had Heppell, Ashby and Dobson in the midfield – none of those guys had played on ball, we were rapt with those three,” Egan said. “McKernan looks really dangerous forward and every time we went forward we felt like he was a chance to mark it. He was outstanding. “Will Hams around the ball was just clean, he’s played a lot of the season now in the AFL and got some real confidence now in his own ability which is great. Egan said the challenge now was to back up the performance and keep building the on things that made the Bombers a good side today like their contested work and team care. “We don’t want to drop in our effort or intent, we felt like we did the three phases really well today and didn’t over-complicate the game plan,” he said.